Today’s Advent candle is dedicated to the Bible… The Bible. Our story as Christian’s. Scripture. It is known as the candle of Preparation. Scripture, hmm. It may not seem incredibly festive or joyous amidst a season of rich food, Christmas carols, bright sweaters and warm hugs from friends and family. In a season overflowing with excitement, ink on a page just lacks a little luster. So though humans wrote scripture on a page, today you’re invited to write it on your heart, because for as much as we read about a manger, your heart is where Christ is truly born. The story of a Rabbi… that’s a good place to start. The overwhelming majority of the Bible takes place before the Christmas narrative in the manger where the Rabbi, Yeshua, was born, and if we are talking Rabbi’s in December, we are probably talking Hanukkah. So outside of what we learned via Adam Sandler’s brilliant songwriting (which taught us key facts such as oj simpson’s non-jewish heritage and gin-intonia’s roll as a celebratory drink), what is Hanukkah? Hanukkah, “the Festival of Lights,” is not among the holidays in the Old Testament. In fact, you won’t find it mentioned in the Old Testament at all… and by no means is it the “Jewish Christmas!” Hanukkah was the festival that Jesus was celebrating in the Jewish temple about this time of year, before anyone started celebrating Jesus. It commemorates events that took place during the “inter-testamental period,” that gap in time between the Old and New Testaments, a good 150 or so years before Mary and Joseph bumped into a messenger Angel. The Jewish people were under the foreign rule of the Syrian king, Antiochus Epiphanies, who had forced them to abandon their culture religion, and worship the Greek God, Zeus. It wasn’t enough to force Zeus on the people, Antiochus was kind of a jerk who felt the need to kick a little extra sand in the wounds of the Jews building statues to Greek Idols throughout the temple so they couldn’t worship Yahweh. He even sacrificed a pig on the altar. Now that may not sound bad for Bacon loving Christians on a Sunday morning, but for Kosher Jews, it’s a pretty big deal! 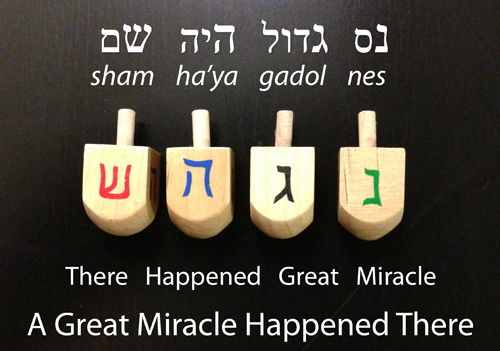 Continuing to look deeper into words and traditions, the spinning Driedle’s message,”nes gadol haya sham,” “A great miracle happened there,” not only serves to celebrate the Jews being able to worship the God of Israel once again, the “re-dedication, but refers to a 2nd miracle that spins us back to Christmas. The first miracle was the fore-mentioned gladiator-esk efforts of the Maccabees, because without their victory, the Jews may well still be worshiping Zeus (thus not Jews at all.) 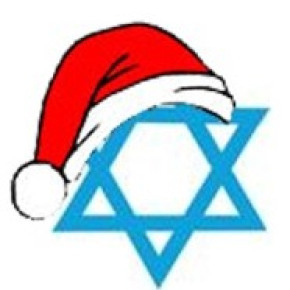 Ponder this, without Hanukkah, there would have been no recognizable Hebrew culture for Messiah to be born into… could there have been a Christmas? The second miracle of Hanukkah is the miracle of light; hence the name, festival of lights. Light. We lit a candle for Advent today… two actually as this is week 2. See a connection? In Judaism, the center candle, the shamash or “servant” candle, is lit first, and it lights all the other candles. Our center candle, the Christ candle, is lit on Christmas Eve, because in being our savior; Christ is our servant and the continuation of the miracle of God’s lighting the earth. Jesus answered, “I did tell you, but you do not believe. We are mid-Hanukkah at this point around a lamp that lit up the city for a time of singing and dancing in celebration of God’s salvation. That’s when Jesus reveals that they were celebrating God’s salvation alongside of the savior… that they were lighting the candle of dedication alongside the eternal candle of life. Jesus backed up the claim though. “I am the light of the world,” he said, and allowed his miracles, life and love to defend the metaphor. How many of us have that kind of confidence that we can testify on our own behalf, and are secure in our faith to confess our beleifs when we do. We started things off today with a “Prayer before a prayer,” because often times we doubt ourselves, doubt that the light of our soul is indeed lit. Jesus, in this passage has confidence! He’s on fire. The Maccabees couldn’t overtake an army if they didn’t believe, that first Menorah couldn’t stay lit without faith, and we will never know our way without light. Jesus reiterates the light metaphor in John 14, stating this time, “I am the way, the truth, and the light. Part of faith lies in knowing where we are going, and I’m not talking Heaven or Hell, nor which way you are turning when you pull out of the parking lot today. Jesus declared, “Even if I testify on my own behalf, my testimony is valid, for I know where I came from and where I am going.” Where is your faith journey taking you? Christ lights the way, he is the way, but we have to follow the light. For a while now I’ve been burnt out on competitive running and thus ran in circles… not really knowing where I was going with it. This past Tuesday evening I was out with Lewis… a 64 year old homeless vet who has joined our runPossible team. We were walking a loop, so “where were we going,” … right back to where we came. Truly, if we don’t know where we are going, any road will get us there, but will the destination be fulfilling? Today we light a candle for the Bible, a roadmap, with the goal that scripture becomes alive in each of our hearts. That it provides us not only a destination to strive for (and remember the eloquent words of one Jerry Garcia, “the journey is indeed the destination,”) but also a light to guide us there so that we never have to travel alone nor in darkness. Christ’s birth in the world should be synonymous with the birth of fulfillment in our hearts… Where are we going? I can’t answer that for you, but when we start heading the right direction we will know.